The camel has once again become relevant to the people of Rajasthan. INDIA: On the edge of the Indian desert, Lakshman Raika boils tea with fresh milk from one of his camels, gently stirring the brew his tribal herdsman have consumed for generations. Far away in city supermarkets demand for chocolates, soaps and skin creams made from such milk is growing -- a boon for nomads like Raika and India's fast disappearing camels. 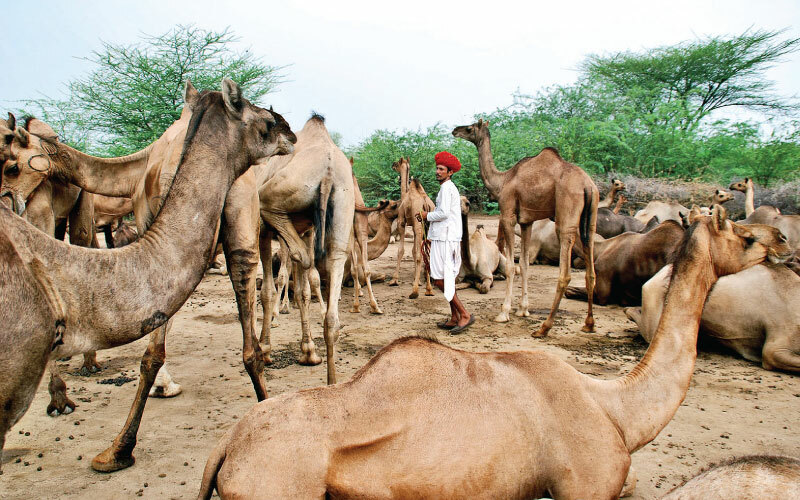 Once dubbed the “ships of the desert” and indispensable to life in India's arid west, camel numbers have steadily declined as they have been usurped by technological upheaval. “Not long ago, village hierarchies in our communities were determined by the size of each family's herd. Not anymore,” lamented Raika, as he smoked a pipe and sipped his tea on the outskirts of Rani, a remote village in Rajasthan state. “These days, just like old men, no one is really interested in them,” he added. Raika has more than halved his herd in the past year. Unable to afford their upkeep, many were given to relatives at bargain-basement prices, he said. Sales have been flat at Rajasthan's famous camel fairs too, where herdsman in red turbans converge on cities like Pushkar and Bikaner with tens of thousands of beasts to trade. The National Research Centre on Camel, a state-run institution in Bikaner, says India's camel population has shrunk by around 30 percent in just a few years. “The situation is indeed worrying,” N.V Patil, the centre's director, told AFP in the city some 500 kilometres (310 miles) southwest of India's capital New Delhi. Even the bones salvaged from dead camels are being utilised -- they are transformed into trinkets and souvenirs for tourists. Camel milk is being touted by some as the latest superfood with supermarkets in the US and the UK, as well as online retailers such as Amazon, also tapping into growing consumer interest. “This market and demand for camel milk and associated products is definitely growing. But it's a challenge having to both create awareness around these products, while also marketing our line of goods,” he told AFP. Camel milk can be a tough sell in a majority-Hindu country where cows are worshipped as mother figures and their milk closely linked to food and faith. It also has a fatty, saltier flavour profile -- something that could prove a challenge in India, where people have grown used to the taste of traditional dairy options. But there are positive signs. Amul, one of India's biggest dairy companies whose mascot is a national treasure, starting selling bottled camel milk in January for city supermarkets in Gujarat, extolling its health benefits. It already sells a boutique chocolate line that includes a camel milk variety. Ensuring supply and quality control are challenges when dealing with semi-nomadic tribespeople and a new, emerging industry, businesses say. But PK Sawal, a senior official at the government-owned camel research centre, insisted there was a viable future for the sector. “These traditional communities will have an economic incentive to keep their herds, as demand for the milk and other camel products increases and the sector matures,” he said. Raika's son Rakesh, a ninth-generation camel tribesman, has been collecting and selling milk from the family herd, making a small profit while keeping traditions alive.